green shirt. We are gaining on the guy in red. 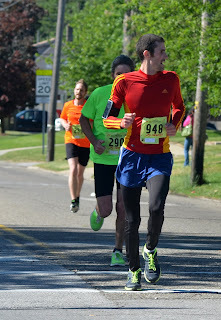 On Saturday, I had the honor of participating in the inaugural running of the Medina Half Marathon. I've got to be honest, going into this running season, I had no intentions of running a spring half, especially not a road half but when I found out that my running club was putting this race on and offering free entry to get the word out about it I figured I might as well. After all, it was on my long run day. I might as well take advantage of a free supported run. I had no expectations. No time goals. A few days prior to the race I cranked out an 8:20 mile, mid run and pretty much thought I was going to die. "Well," I thought, "I guess a PR is out of the question." I chuckled to myself and finished out my run. This last year has been dedicated to distance trail running. I have spent a lot of time out on trails. I've put in a lot of slow, hilly, difficult miles. I ran a 50k last fall and my goal is to complete the Not Yo Momma's 100k this September. Needless to say, speed work has not been a priority. But no big deal. My dad was running it too and I figured we'd just go and have a good time. The morning of the race, my dad picked me up at 6:15 and we headed to packet pickup. The race starts and ends at the Historic Medina Square. It's a quaint little downtown area, with old timey storefronts everywhere. It was 35 degrees and sunny. The temperature was rising steadily but it promised to be a fairly cool day. Both my dad and I were wearing warmup pants and jackets over our shorts and long sleeve tech shirts. We pinned our bibs to our shirts and headed out for a 1 mile warmup. After our warmup we headed back to the car to drop off our jackets and pants, then headed to the start line. Considering that this was just a training run I decided not to use any GPS. My dad was wearing a watch with a stopwatch function and had decided to track our time on that. Since he had just PR'd at the Flying Pig Marathon a few weeks prior, he had no time goals either and so we decided to stick together, go out at a comfortably hard pace, and just see what happened. This is a PR course if I have ever seen one. The first four and a half miles or so are primarily downhill. Just after mile 3 you run through a park, utilizing a dirt road and a section well kept grass path. Prior to entering the park we had maintained an 8:30 pace (Not surprising considering it was mostly downhill) but lost several minutes waiting in line to use a port-o-potty. As we entered the park we calculated that our average had fallen to about a 9:15 pace. We were both perfectly content with that and continued to run at the same effort level. At around the four and a half mile mark you exit the park and take on the "one big hill" we had been warned about at packet pickup. Honestly, I was a little surprised by the hill. I mean, it's a long climb, maybe three quarters of a mile but I'm guessing you only climb seventy five or a hundred feet over that entire distance. We maintained the same effort and barely slowed our pace. For miles six through ten, I can think of no better way to describe the course than simply that they were pleasant. We weaved through neighborhoods filled with modest yet beautiful homes, well manicured lawns and peppered with families standing at the ends of their driveways cheering for the runners as they passed. There were no real hills to speak of and with each passing mile our average pace fell closer and closer to the 8:30 pace we had started with. As we approached the 10 mile mark, my dad asked me how I was feeling. "Good" I replied. "I think we should try to Pedro it. (Make the last 5K the fastest 5K of the race). My dad agreed and so we began to steadily increase our pace, each mile faster than the one before it. When we hit mile twelve, my dad took the lead. I estimate we were running somewhere close to a seven minute pace. At less than a half mile from the finish line I was going to be sick. "I'm gonna puke." I said to my dad. "Hold it." He replied without looking back. "I can see the finish line. You can do this!" He broke into a full on sprint. I swallowed hard and tried to follow. With about 100 feet to the finish line my cardio had reached it's limit. I was forced to ease up a little and coast through the finish line fifteen or twenty seconds behind my dad. We crossed the finish line in 1:48, a PR for both of us. I was honestly shocked at how good our time was. Through the whole race was continually anticipating the bottom to drop out and to have to slow down but it never happened. I definitely recommend this race and will most likely sign up for it again next year. There aren't all the bells and whistles of a big city race but, honestly, I didn't miss that. This is a pleasant, flat, loop course with fantastic community support! Early registration has already begun and right now the cost is only $30. If you are thinking about a spring half, you should definitely consider the Medina Half Marathon!